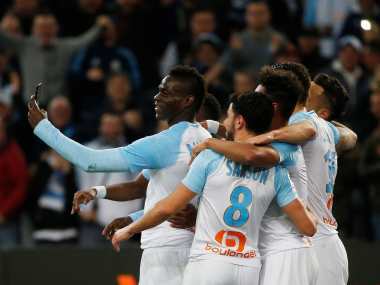 Paris: Mario Balotelli showed off a new goal celebration on Sunday as he took a selfie video with his Marseille teammates and posted it on social media during their 2-0 win over Saint-Etienne. 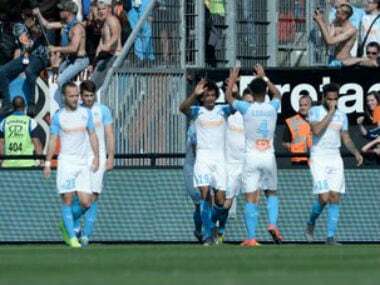 The Italian scored his fourth goal in six Ligue 1 games since joining Marseille from Nice in January by hooking home Florian Thauvin's 12th-minute corner with an excellent acrobatic volley. "Balotelli takes the pressure, he takes the limelight. He reminds me of (Zlatan) Ibrahimovic and he scored an Ibrahimovic goal," said Saint-Etienne coach Jean-Louis Gasset. "He has brought back the public, the confidence, and many of his teammates will raise their level of play." As he celebrated his volley, Balotelli took a phone from the cameraman behind the goal before filming the video with his laughing teammates and posting it on his Instagram story. The 28-year-old then carried on playing. He was not the first player to produce a selfie-based celebration, after Roma great Francesco Totti took a picture of himself after scoring against Lazio in the capital-city derby in 2015. Marseille doubled their advantage nine minutes later through a Thauvin penalty and closed out the win with ease. Rudi Garcia's men have now taken 13 points from their last five league matches to leapfrog Saint-Etienne into fourth, just five points adrift of Lyon in the race for the third and final Champions League spot. Earlier on Sunday, Moussa Dembele scored twice as Lyon thrashed Toulouse 5-1 to strengthen their grip on a top-three spot. Bruno Genesio's Lyon, who are also through to the French Cup semi-finals and claimed a 0-0 first-leg draw in the Champions League last 16 against Barcelona, continued their strong season by moving six points clear of fourth-placed Saint-Etienne. 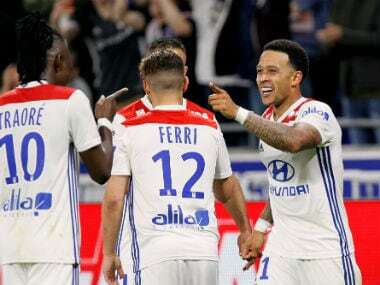 "Often this season, we haven't been calm under pressure, but against Toulouse it was a good match," said Lyon captain Nabil Fekir, whose 21-year-old younger brother Yassin made his Ligue 1 debut as a 79th-minute substitute. "Playing with my brother was a huge pleasure." The home side took less than 10 minutes to break the deadlock at the Groupama Stadium as Memphis Depay fired home a wonderful individual goal. Mathieu Dossevi levelled for Toulouse on the quarter-hour mark, but the visitors folded after Bertrand Traore restored Lyon's advantage in the 30th minute. Nabil Fekir netted a penalty five minutes later, and former Celtic striker Dembele compounded Toulouse's misery in the second half. He powered through the pitiful away defence midway through the second period and slotted a left-footed shot into the corner, before tapping in his 13th goal of the season shortly afterwards from Fekir's low cross. Traore also had another goal ruled out by VAR for offside, while Toulouse finished the game with 10 men as former Bastia midfielder Yannick Cahuzac was sent off for the 11th time in his Ligue 1 career. Lille remain second behind Paris Saint-Germain after Christophe Galtier's men claimed a narrow 1-0 win over struggling Dijon. With PSG still 17 points clear at the top with a game in hand, Lille are well-placed to secure a return to the Champions League group stage for the first time since 2012. Dijon, who remain five points from safety in 19th spot, made life tough for Lille at the Stade Pierre-Mauroy until Wesley Lautoa put through his own net in the 72nd minute. 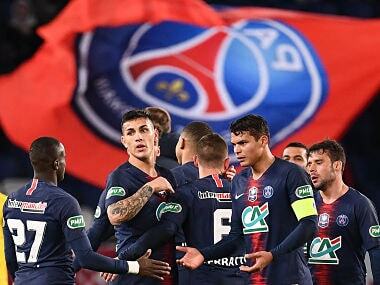 "We will continue to work to be able to hold off the teams who want to take our place, qualifying for the Champions League is a dream we will try to achieve," said Lille forward Rui Fonte. Elsewhere, Patrick Vieira's Nice boosted their hopes of qualifying for next season's Europa League as Youcef Atal's 20th-minute strike was enough to see off Strasbourg 1-0. Nice are seventh in the table, four points adrift of Marseille.